In the early 1960s Bryant Tuckerman realized that the latest computer technology could be put to good use calculating historical planetary positions. He published a two-volume ephemerides, providing tables of planetary positions from 601 BCE to 1649 CE. The “Tuckerman Tables” quickly became the standard reference for historians of astronomy. While more recently on-line resources might have begun to erode the usefulness of the “Tuckerman Tables,” they remain an excellent resource when working with old reports of planetary positions, especially conjunctions, oppositions, and other inter-planetary aspects. Historians of astronomy were not the only group of scholars who turned to the “Tuckerman Tables” when evaluating historical sources and events. Astrologers eagerly purchased and used these tables in their efforts both to understand the past and to assess astrology’s ability to explain the present. 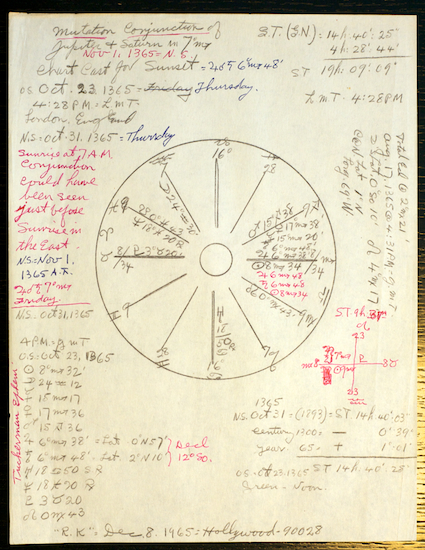 One such astrologer was Ralph Kraum, who in March 1965 purchased his copy of Tuckerman’s Planetary, Lunar, and Solar Positions, A.D. 2 to A.D. 1649 at five-Day and Ten-Day Intervals direct from the American Philosophical Society for $7.50. Kraum’s copy is filled with charts and fragments of astrological and astronomical calculations as he cast nativities for a wide range of historical figures. In many instances, he recorded the person’s name on the piece of paper as well as his own name and the date. On 6 April 1965, one of the first nativities he calculated with Tuckerman’s tables was Emperor Justinian’s, which he compared against the chart found in Maurice Wemyss’s More Notable Nativities. Unfortunately, Kraum did not record either the final version of this chart or his interpretation of it. On 1 July 1965 Kraum calculated the planetary positions for Montaigne’s natal chart, and again compared his numbers to Wemyss’s chart. Appropriately, in 1965 Kraum calculated planetary positions for Nostradamus’s nativity and then in 1967 Kraum twice calculated various data for John Dee’s nativity. In 1969 he calculated planetary positions for Elizabeth of York, wife of King Henry VII. He noted that Elizabeth’s birth date was uncertain. On the back of a receipt for a “400 day globe” that he purchased for $2.94 from E. W. Reynolds in October 1953, Kraum evaluated some possible dates for Elizabeth’s birth before concluding that she “must have been born on 1465 Feb. 11.” Ferdinand V and Isabella of Spain attracted Kraum’s attention in 1965. Dozens of other slips of paper bear the traces of Kraum’s efforts to calculate horoscopes for historical figures. Kraum’s efforts to calculate famous nativities was not merely a hobby. He was continuing a practice that astrologers had begun at least as early as the fifteenth century, when Martin Bylica amassed a collection of hundreds of horoscopes. He returned to these charts again and again, refining his calculations, adding notes and highlighting different features, and adjusting his interpretations. By the sixteenth century collecting and comparing famous nativities had become a key aspect of an astrologer’s professional. The Italian astrologers Luca Guarico and Giordano Cardano competed with each other through their published collections of genitures. The practice of calculating and recalculating horoscopes in order to understand better how to interpret the celestial positions continues even today. 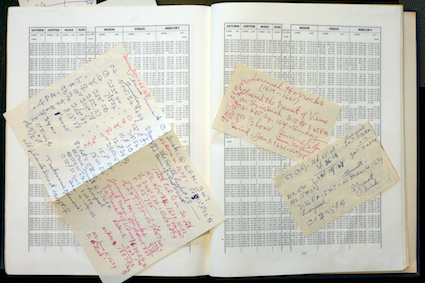 When Kraum scoured his copy of the Tuckerman Tables for the data that he could use to evaluate and judge the work of his predecessors, he was practicing critical astrology. For centuries astrologers have turned a critical eye on their own work and that of their predecessors and competitors. In addition to horoscopes for famous people, Kraum left the remnants of his efforts to calculate the important celestial data for eclipses and significant planetary conjuctions—he covered more than dozen sheets of paper calculating relevant data for the Saturn-Jupiter conjunction that occurred on 18 December 1603 and compared his results to those by an astrologer named Robson. Kraum was also interested in historical transits of Venus, calculating planetary positions for the a number of them as early as 23 May 60 CE. Kraum seems to have been particularly interested in the transit on 24 November 1639 (England was still using the Julian calendar; according to the Gregorian system, this transit occurred on 4 December 1639). Ralph Kraum’s copy of the Tuckerman Tables, opened to the pages for the 1639 transit of Venus (Source: Author’s collection). The transit that year was the first observed by European astronomers: Jeremiah Horrocks and William Crabtree. Horrocks had corrected previous astronomical tables that had indicated that Venus would just miss the sun—he probably corrected Philip Lansberge’s tables. Lansberge seems to have rejected Kepler’s elliptical orbits and thus predicted that Venus would just miss the sun. Horrocks recalculated the positions and predicted that Venus would in fact cross in front of the sun’s disc. 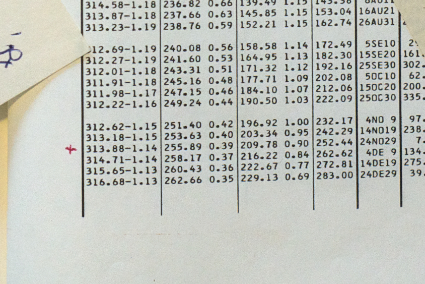 Kraum put a small checkmark in the margin to note the date for the transit of Venus (Source: Author’s collection). Kraum covered three sheets with numbers and astrological data. How long the transit lasted, the positions of the planets (including Uranus, Neptune, and Pluto), the medium coeli and the ascendent. He also noted twice that Horrocks was the first person to witness a transit of Venus. Kraum’s efforts to determine the relevelant astrological information from the transit of Venus in 1639. 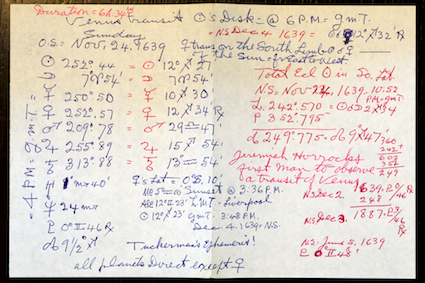 Kraum also noted on this piece of paper that Horrocks was the first person to observe a transit of Venus (Source: Author’s collection). Unfortunately, Kraum did not record how he interpreted this information. As with his other astrological calculations, he was doing more than simply passing time. Kraum was trying to use astrology to understand his world, and the transit of Venus offered him some glimpse into that world. As did the conjunctions between Saturn and Jupiter. Kraum enjoys two claims to fame. Beyond the world of professional, practicing astrologers, Kraum gained renown for his famous clientele—he was a prominent astrologer to the actors in Hollywood. Notably, he was one of Ronald Reagan’s early astrological counsellors. Apparently, during his acting years Reagan began seeking advice from astrologers, long before Nancy brought Joan Quigley into the White House. Amongst astrologers, Kraum gained some fame for his work on the Saturn-Jupiter conjunction that occurred in 1365. He clearly spent considerable time and energy thinking about this conjunction. The most complete and elaborate chart to survive in this book is Kraum’s chart for this conjunction. Kraum’s chart for the Saturn-Jupiter conjunction. He returned to this chart at least twice to correct or add information (Source: Author’s collection). Here Kraum adapts the theory of great conjunctions, which correlated the conjunctions between Saturn and Jupiter with broad, large-scale changes on earth. There were three types of conjunctions: great conjunctions occurred every 60 years, greater occurred every 240, and greatest occurred after 960. The rarer the conjunction the greater the effects on earth. These effects ranged from the rise and fall of religions and kingdom, to the appearance of plagues and epidemics. Kraum seems to be applying a form of this theory in his analysis of the “Mutation Conjuction” in 1365. We may not agree with the intellectual system of astrology, but it cannot be dismissed as simple or uncritical. The trail of intellectual breadcrumbs Kraum left behind provides tantalizing glimpses at the rigor of his system and the self-imposed evaluation that occurs. It is hard to see these scraps of paper as part of some elaborate ruse to swindle customers out of their money. It also does not seem that Kraum was disingenuous in his belief. Moreover, Kraum’s work reveals a person skilled in positional astronomy, a person who seems almost to enjoy the calculations. Whatever he was doing, it cannot be equated to horoscopes in the daily newspaper or written off as the dogmatic ravings of a money-grubbing fraudster.